There are currently 90,643 users on this website. Help Needed With This Coin. I have done plenty of research into the history surrounding this coin. However I haven't been able to identify the metal used with this coin. However I do not not know what kind of metal was used with it. It looks like it is gold to me but no sure. This is a "To Hanover" token. While they were used as game counter pieces and may have seen some circulation as tokens, these were also a political token. When Queen Anne died in 1714, she did not have an heir to the throne. So a search through the family tree was made to find the closest suitable heir to the throne. This turned out to be George Louis great grandson of James I and King of Hanover, a German state. He became George I of England but retained his title to Hanover as well as did his successors George II, III, IV, and William IV. Salic Law did not permit a woman to be an heir to titles in Hanover when Princess Victoria succeeded to the British Throne in 1837 on the death of William IV. These titles, which had been held by kings of the United Kingdom since George I, therefore passed to the next male heir, Ernest Augustus, Duke of Cumberland. He was unpopular in England and it was said that the scars on his face had been caused by his Corsican servant in self-defence, before the Duke murdered him. The Duke is believed to have committed other crimes and, to add to his unpopularity, he was opposed to Parliamentary reform and the emancipation of the Roman Catholics in this country. Worst of all he had shown himself to be greedy for the British throne and to have opposed the succession of the people's beloved Victoria. Kuhli, That was the same piece of history I un-covered. I wasn't able to uncover the history of this token. Thankyou very much for that, I really do appreciate it. I thought I had struck gold....haha maybe next time. I must say though the coin colour is much lighter then expected from a copper coin? One thing I forgot to ask. Are they common or harder to find? Do you know of a price? I know it is in poor condition. EDIT: here are some To hanovers on Ebay, should be a good indicator. AWESOME info there, thankyou. That answers all my questions. I didn't think to search ebay. I have seen dozens of these over the years of searching eBay, ranging from ugly dark copper or bronze, to shiny brass, to the occasional (but uncommon) silver pieces. I have seen them dated 1837, 1838, 1897, and updated. The legends vary dramatically in both text and font. They range in size from as small as a US dime, to larger than a quarter (uncommon this large), normally range in the size between a US cent and a nickel. The standard common varieties tend to sell for the US$2-10 range. Here is the only example I still have in my collection. Undated, with a longer obverse legend, and the reverse legend is "Off to Hanover"
I have a question about this coin, why does it have the St george squashing the dragon on the front (or back, can't work out which is which yet)? Although it does mimic the "St. George slaying the dragon" theme used on sovereigns and other coinage, the design is actually something else. The figure on the horse is supposed to be the Duke of Cumberland, who went "to Hanover" to become the ruler that Victoria wasn't allowed to be. The dragon underneath is actually a 2-headed creature, which represents the dual kingship of Great Britain and Hanover, which ended when Victoria took the throne of Great Britain and the Duke took the throne of Hanover. 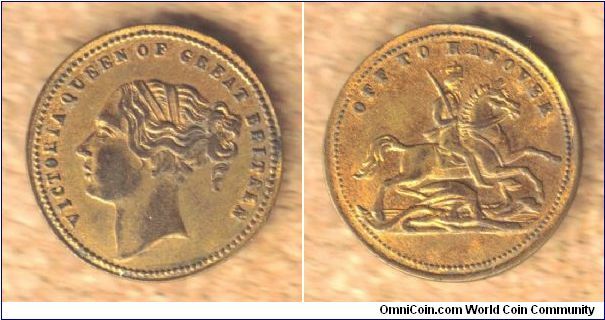 Thus in 1837, we see (on obverse) Victoria, Queen of England, and (on reverse) the Duke of Cumberland, destroying the dual kingship and headed "to Hanover." Victoria appears to have been a providential choice for the throne as there were at least 4 others ahead of her- yet one by one they were removed until she was made the queen. She herself believed it to be providential- She was a very religious person-Britain became the most prosperous they had ever been under her rule- It was during her rule that the "Sun never set on the British Empire"
She was just part of the right religion, according to the UK. It took 0.88 seconds to rattle this change.